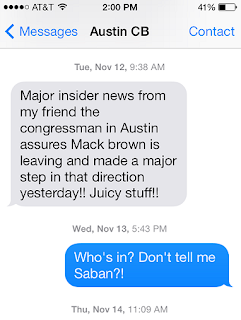 *Source of mine in Austin texted me on November 12. He's tight with a state congressman who's on Texas' Board of Regents, and his message was that Mack Brown was done as head coach of the Longhorns. The decision had been made. He was right. And so have been all the rumors we've been hearing for a month. Very obvious that your "source" is Chip Brown. Yep. Verrrrry obvious. But not. Chip Brown has broken every bit of news on this story. Your contact name is Austin CB. Like I said, obvious even if you won't admit it. He has no Texas source. He changed Sybil's contact name to Austin CB, then he used her phone to text him that quote. Yes, he's that big of a hack. And pathetic. Lol, that's the insight you get for $60 a year!! Just read half a dozen wish lists for the future gridiron coach at UT....oh, and all without paying a dime and without having to wade through incessant whining and finger pointing about getting fired, woefully uninformed political viewpoints, faulty amateur weather predictions and yet another tired and played episode of white truck Wednesday. From this comment it's obvious you haven't seen the ratings. Um, you should probably double-check. Sorry to burst that bubble. Brad, I'd give you $5.95/ month for your blog. 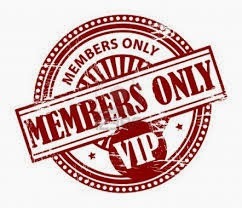 There is nothing on Brad's blog worth reading unless you want to know what color underwear The Ticket hosts have on. What do they pay you to shill for them? Coffee cups and oven mitts? Oh and your Rangers pre-season piece was in the DMN. Even the comment section isn't fun anymore. Failed smile walking away from my broken tricycle. God I hope The Ticket doesn't tell their listeners to stand in front of a moving bus, because if they did, this comments section would be empty. Are any of you capable of independent thought? I don't know does that "independent thought" cost $4.95 per month???? Apparently for you that would be a bargain. You just made my point,. 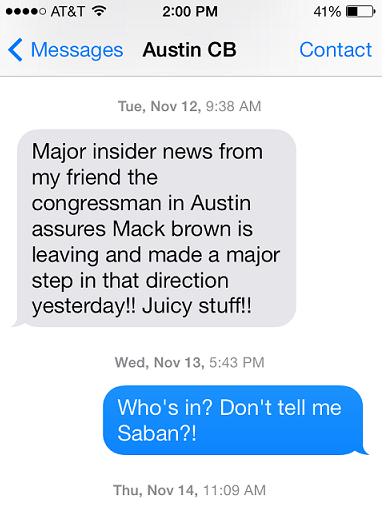 That "insider" message must of been SOOO important it took you a day and a half to reapond to his text!! I get it... $4.95/hair plug.